Photopia™ is a fast and accurate optical design program that produces comprehensive performance evaluations for non-imaging optical systems. Photopia allows you to produce virtual designs in a fraction of the time and for a fraction of the cost of physical prototypes. Photopia includes a built-in CAD system or is available as an add-in for SOLIDWORKS®. Our standalone CAD system interfaces with packages such as SOLIDWORKS®, AutoCAD®, Pro/Engineer CREO®, SolidEdge®, and Inventor®. With Photopia for SOLIDWORKS®, you can perform raytrace simulations directly on your assembly models. From adding lamps and assigning materials, to setting and viewing output, everything is done inside of SOLIDWORKS. 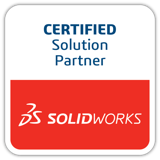 You maintain all the ease of working in SOLIDWORKS, with no need to learn another CAD program. This is complete single window optical-mechanical integration. No need to link, bridge, or export files for your analysis and potentially lose fidelity. Work in your familiar CAD interface to increase productivity and get your work done faster. Photopia is designed so that you don't need an optics PhD in order to understand the software. Use our library of pre-defined lamps and materials, use our design tools to generate optical geometry based on your design requirements, and get output in industry standard formats. Most Parametric Modeling relies on primitive geometry like lines or arcs or splines... but none of these directly relate to how you want to aim light. Our Parametric Optical Design Tools (PODT) give you a direct way to create and manipulate geometry based on how you want your final distribution to look. PODT can be used on anything from simple revolved reflectors to complicated lofted lenses made of multiple control profiles. PODT is all about getting you to a final design quicker. We use these tools everyday on our projects and they significantly reduce the amount of time it takes to optimize a design. The core of any optical simulation is accurate ray generation and accurate ray interaction, in other words, an accurate lamp model and accurate material properties. Instead of relying on our user to adjust theoretical material equations or use simplified lamp models with only ray data, we've spent the time to measure, analyze and model all 1900+ lamps and materials in the Photopia library ourselves. With 25 years of history in raytracing, we know what is required to produce an accurate simulation. We use the software everyday in our own design work, so we have to trust it. Photopia generates fully compliant IES, TM-14, and EULUMDAT files with every raytrace. Illuminance planes can be used to evaluate beam smoothness, full 3D ray paths can be used to identify areas for design optimization, and a host of plots can confirm your design. Photopia also has the latest output requirements like IESNA TM-15 and BUG ratings. There's also a report for analyzing color uniformity which includes industry relevant metrics like color change over beam and field angle as required by EnergyStar and DLC. Photopia has an integrated CAD system so that you can create and optimize your optical design without going back and forth from your CAD system. You can also import your mechanical parts from leading CAD software like SOLIDWORKS, Inventor, Pro/E and AutoCAD using STL and DXF/DWG files. Once you have an optimized design, you can export the geometry back to your CAD system as a 3DM or DXF/DWG file. There is also Photopia for SOLIDWORKS which is an add-in for SOLIDWORKS that lets you setup, analyze and view output directly inside of SOLIDWORKS. Both versions of the software have the same functionality. Instead of iterating with physical prototypes that you must spend time building and testing, iterate inside of Photopia, where the only cost is your own time. Fewer prototypes means reduced testing time and expense. You can also test many configurations quickly versus building and sending each option to a test lab. Over the same time period, with Photopia you can test and iterate over more designs than with physical prototypes, which lets you get to the most optimal design. Any piece of business software should pay for itself quickly, or it is not worth having. You already invest in CAD software because the productivity gained versus manual drafting is beneficial to your bottom line. The same should be true of optical design software. By allowing you to reduce physical prototypes, reduce testing costs and achieve more optimal designs, optical design software like Photopia should be a positive addition to your business. Without Photopia, after your initial design, you'll likely need to build, test and refine on a physical prototype several times, costing you significant time and money. With Photopia, you shouldn't need to iterate after your first prototype, saving time and money. Many optical programs on the market are targeted towards imaging optics with non-imaging as a side feature. Photopia is specifically designed for architectural lighting as well as most other illumination based, non-imaging optical design tasks. The majority of the companies in the architectural lighting industry who sell performance driven products use Photopia. A few of the major companies include Philips and its may subsidiaries, Acuity Brands, Cooper Lighting, General Electric, Havells-Sylvania, Cree, Hubbell Lighting, the Indal Group, R-Tech (Schreder), Toshiba, Gerard Lighting, AB Fagerhult, ETAP, LG Electronics, iGuzzini, Louis Poulsen/Targetti, Luxo and many others. For those customers who have switched from other software, the speed and accuracy of the raytracing were the most important reasons. If you can't trust your results, then the entire point of simulating your designs in the first place is lost. Photopia includes the most comprehensive library of lamps for the architectural lighting industry. The current library includes over 900 source models with a large selection of LEDs, and also includes sun and sky dome models for daylighting device designs. This extensive library avoids the need for the user to create their own lamps and guess at their properties. Having accurate source models is essential to getting accurate simulations of the entire luminaire. Other programs that rely heavily on ray sets may not be as accurate as models in Photopia's library. Other software allows you to define BRDF (BSDF) data via parameters of various mathematical functions, but knowing what parameters to set is an open question and even then the scattering behavior of many materials isn't accurately represented by a mathematical function. Although BRDF/BTDF data for standard materials is now being distributed by manufacturers, it is also very important that the optical software company is able to measure custom materials, such as formed aluminum with various levels of polish and anodizing processes. LTI Optics has provided this service since the late 1980’s, longer than any other company, and has more experience in characterizing the important optical properties of materials. Having measured BRDF/BTDF data for the actual materials used in your products is critical to being able to produce accurate simulation results. Photopia provides a range of industry standard output right out of the box. You don't need to jump through hoops to generate standards compliant IES, EULUMDAT & TM-14 files, rather, Photopia creates these every raytrace. You'll get indoor and outdoor CU tables and plots, roadway iso-illuminance plots, a photometric report with detailed analysis results. You can view multiple illuminance planes along with candela distribution data after a single raytrace since our data collectors don't block each other. This is very important if you want a detailed evaluation of a design. We have several customers who previously used other optical software and they said it typically took several hours to trace 100,000 rays. Photopia can typically trace millions of rays in minutes and the speed is not linearly related to model complexity. Also, since some programs store all rays in memory, the max number of rays you can trace is a function of your system resources. For detailed candela distributions and illuminance plane data, you need to be tracing 5 to 10 million rays. Tracing an inadequate number of rays can lead to insufficient detail in the results and therefore an incorrect conclusion about the actual performance of the product. 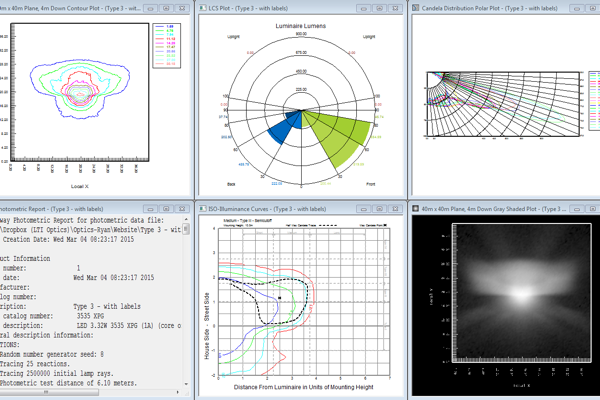 Photopia's Parametric Optical Design Tools (PODT) module provides an environment to design reflector and refractor geometry that can be controlled by meaningful optical parameters as opposed to mechanical parameters that you define in parametric solid modelers. The geometry is created based on how you decide to aim the light. Because of these tools, you will typically import your housing and outer lens geometry once and then create and modify your reflector geometry inside of Photopia. You won't typically be modifying parts in your CAD software and re- importing them over and over. The PODT module has been developed as a direct result of LTI Optics’ own experience on optical design consulting projects over the past 20 years. The methodology used in these tools is therefore proven to produce results for a wide range of product types. The scope of these tools also continues to evolve so they can address as many types of designs as possible, since the design process is greatly shortened when these tools are utilized. These tools are unique among all optical design software on the market, with other programs simply offering “optimizers” that attempt to optimize starting point geometry that the user provides. If parameters of that geometry can’t be modified to reach the desired goal, then they won’t converge on a design. The use of such optimizers is therefore strongly dependent upon the skill of the designer providing the starting point optical geometry. LTI Optics puts a very high priority on customer support. The main person providing technical support to our customers is the lead designer for the Photopia software, its product manager since its inception, and our most senior optical designer. Many companies pass the job of technical support to a junior level employee. Having designed almost every type of luminaire within our industry, we have a clear understanding of the types of projects our customers are creating and can help them in a more meaningful way. Although we can't comment on how our competitors handle support since we have not been a customer of theirs, we can say that we get a lot of positive feedback on our support. Mark, I wanted to extend my sincere thanks for your help the other day and all the help that you and your folks have provided me in the past. The speed of your responses and the thoughtfulness of your explanations has gone a long way towards helping me to better understand the workings of Photopia. Your dedication to customer service stands as an example that others should follow. Please extend my thanks to all. We are very happy with the accuracy of Photopia. We have our own goniometer and have made many comparisons between the predicted and measured results. We have found Photopia to be so accurate that whenever we have seen a difference between the measured and predicted performance, our measurements have turned out to be wrong. I have purchased and learned software for the past 10 years and I have never had the quality of tech support I received from Mark [Jongewaard]. I've been a fan of Photopia for several years. It provides me with useful results within minutes which allows me to look at many design iterations in a short amount of time. I find it invaluable for refractors which are nearly impossible to prototype. We've used Photopia for several years and believe it has been the second most important purchase made for product development, second only to to the purchase of an automated punch press. Our lamp library contains over 1000 fully measured and modeled lamps, including full spectral data. There are over 700 scattering reflective and transmissive materials. This is real measured data. Allows you to trace refraction, which is necessary if you're designing or analyzing lenses that bend light using refraction. The lamp library contains lamps from leading Tier 1 and 2 manufacturers, all fully measured with accurate 3D geometry and modeled with proper 3D ray emanation points and directions. Models also include full spectral data, including color variation over emission area, and color variation over emission angle. We have BRDF/BTDF data for over 700 commonly used reflective and transmissive materials commercially available from major material vendors such as Alanod, ACA, Anofol, Sacall, Foremost, Reflek, Abrisa, Cryo, ALP, White Optics, Brightview and others. If you use materials such as semi-specular aluminum, white paint, textured aluminum, prismatic lenses, white diffusing lenses or perforated steel, then you'll find materials like that in the library. LTI Optics also provides material measurement services for custom materials you use in your products. Refractors are modeled by drawing the actual prism or lens geometry in Photopia or your CAD program. Photopia uses the index of refraction and the extinction coefficient of the material to accurately model refraction into the material, Fresnel reflections from the inner and outer surfaces of the material, total internal reflection (TIR) effects and losses due to absorption within the material. These materials are used for LED modeling and lens design, roadway refractors, Fresnel lenses, light pipes, signaling lenses or any other design for which you need to control light using refraction. Note that homogeneous prismatic lenses, white translucent lenses and perforated surfaces are available in the General Materials Library and do not require the Refractor Module. For more information about the difference between the "transmissive" materials in the General Materials Library and "refractors" modeled with the General Refractor Module, click here. The first step to evaluating if Photopia is a good fit for your company is to schedule an online demonstration where one of our expert optical engineers will discuss your projects and give you a walkthrough of the software. After the online demo, we're happy to provide a 1 week trial license so that you can use the software on your own projects or show it to others in your office. Does the lamp library have the lamps you use? Does the material library have the materials you use? Can you import your models into Photopia? Does the reduced prototyping and testing expense justify the cost of the software? Want to start a trial? We sell direct and through a network of international representative. In order to provide a quote please contact us and we'll either provide one or put you in contact with the correct representative. Photopia standard can be installed and licensed on a single workstation. Photopia Premium can be installed on a single workstation, or shared among multiple users via a network license. Please review the License Agreement when installing Photopia for restrictions. If your need for Photopia is occasional, we offer an option of leasing our software. Leasing can be done in 3 month or 12 month increments. Contact us for lease pricing. If you already have a design and just want a quick analysis, we can import your CAD model, setup the Photopia analysis and provide you the output. This allows you to get a quick, accurate simulation without needing to learn or purchase the software. Contact us for information about this option. If your need for optical design is occasional and you're not an expert in optics, it often makes more sense to make use of our consulting services. In additional to being proficient users of Photopia, we have vast knowledge of optical design and can likely provide very good insight and solutions for your project. Contact us for an optical design quote. Most customers learn all they need from the User's Guide and Tutorials. Training is always just for your company. This allows us to tailor the training content and work on your own projects. It's basically 2 days of consulting, but you'll learn Photopia by the end of it. Training costs depend on location (your office or ours), number of students, and length of training (typically 2 days). Please contact us for a quote and to schedule training.